In these past weeks, conversations about race and poetry have been especially on high alert, from the enraged responses to Kenneth Goldsmith’s appropriation of Michael Brown’s black body in a piece performed at Brown University to the Mongrel Coalition’s loud denouncement of Goldsmith’s actions as well as their heavy critique of poetry movements like conceptualism that heralds a privileged form of (white) erasure. We ask ourselves what the poetry of the “avant garde” constitutes now that the political discourse of race has continuously ruptured the supposed neutrality of form and poetic practice. Chiming in on this dialogue about experimental poetics and race is Nests and Strangers, a forthcoming anthology of essays from Kelsey Street Press on four pivotal Asian American women poets, Myung Mi Kim, Nellie Wong, Mei-mei Berssenbrugge, and Bhanu Kapil who have each in their own way altered the conversation of poetics and political possibilities through their artistic practices and life’s works. In this seminal project, Timothy Yu and Mg Roberts, the anthology’s editors honor the poetic contributions of Asian American women poets who have in some way contributed to the legacy of Asian American poetry, art making, history, and activism. Rather than asserting a fixed categorization of an experimental poet, the anthology brings in four contemporary poets and scholars, Sarah Dowling, Merle Woo, Sueyeun Juliette Lee, and Dorothy Wang, to discuss how innovation in poetry in the works of Kim, Wong, Berssenbrugge, and Kapil means more than just what transpires on the page but also through their lived experiences and subjectivities as well. Perhaps this is where the heart of our current contention over race and poetry lies—the inability of others to see how poetics and marginalized experiences might intersect. In this sense, the project of bringing together these iconic poets and the writers who have so thoroughly been inspired by them bring a sense of organization to when this intersection gets murky when entered into a place of public discourse. Of course, as Asian American women, we know by our psychic experiences and connections that we have certain ties to language that recognize that our individual memories are tethered to a constantly shifting communal one. Yet one of the greatest struggles of writing as an Asian American woman poet in the world is the effort to assert that our presence matters in the way our experiences and memories matter—that they may not exactly take the shape and form one might expect in the performance of a work, but that our expression is derived from a significant and oftentimes omitted history. Thus, Nests and Strangers grant us that assurance that personhood is not divorced from political or artistic expression for the Asian American woman poet. 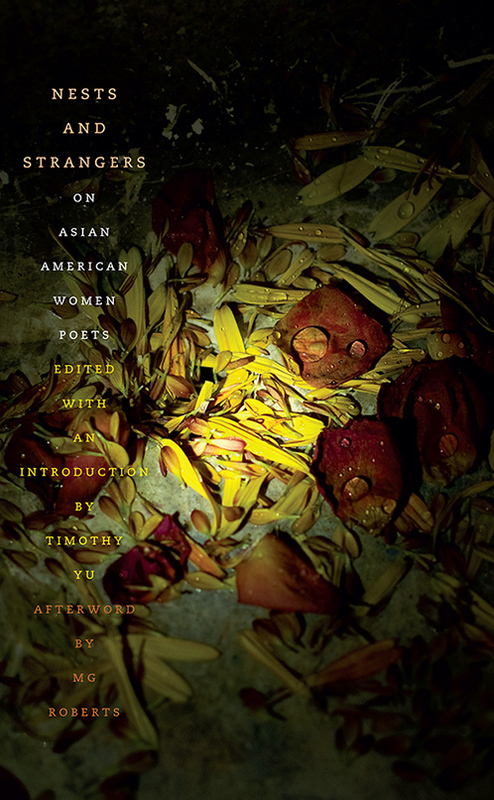 In Yu’s introduction to the anthology, he asks the pivotal question, “How can personhood emerge from the welter of contemporary discourse, particularly when that discourse continues to be shaped by racism, sexism, and colonialism?” Nests and Strangers traces this question from the early activist and community driven work of poets like Wong and Berssenbrugge to the poetic utterances of Kim and Kapil’s writing that transforms the space of diaspora, immigrant longing, and linguistic ruptures via the page. Dowling, in her essay on Kim, explores the way in which her poetry makes visible the various denials of personhood when one’s language is constantly subjected to erasure. Kim’s poetics of “stutterance” through emphasis of difficult sounds, repetitions, and fragments, draw attention to the political sensibilities of language, to give voice to “figures who are tasked with simply enduring.” The persistence in struggle is echoed through Woo’s moving dedication to Wong’s work, which she declares as a “truly revolutionary art” for merging familial and community narratives with global politics in the necessary work of seeing one’s freedom as contingent upon the liberation of another. Wong does so through reinvigorating the “I,” which has become the white male American default, through her allusion to Walt Whitman’s famed work in “I Also Sing of Myself.” This reclamation of the “I” to give voice to the marginalized subject can also be seen in Berssenbrugge’s work though her approach varies from Wong’s. In Lee’s discussion of Berssenbrugge’s work, she describes her writing as a series of “porous interchanges between self and the world.” Berssenbrugge’s work maps the various ways in which one perceives the world, which is a political act that exposes our subjectivities through our means of interpretation. Lee’s essay on Berssenbrugge moves from a discussion of her rich biography that includes influences by various communities and artists to her innovative use of parataxis to establish a sense of continuity and discontinuity between human consciousness and the world. If Berssenbrugge’s poetry is about connection, then Kapil’s work explores these tethers in light of the violence of displacement, forced migration, and other ways of identity fragmentation. Wang on Kapil, writes, “What does it mean for an ‘I’ to be destabilized yet always connected to something larger…?” Written in an essay form that pays homage to Kapil’s poetic fragments, this last essay in the anthology offers up Kapil’s work as an example of a “future poetics” that interrogates the “post” conditions of our world and the residues of violence and trauma that it leaves behind. The “post” is not only the historical and political transgressions that mark us but the writing and capturing of them as well, and therein lies the years of poetry work ahead of us. Aptly, the title of Roberts’ afterword to the anthology, “Notes Toward an Afterword: What Entrails” plays on the notion of final claims as well as the physical remains of such an artistic practice as poetry. If the essays themselves do not make it clear, Roberts’ statements remind the reader that for the Asian American woman poet, poetry is about guts—an embodied process that intimately involves the individual person and is inextricable from a politicized existence. The notion of an Asian American woman avant garde poetics is a continuous one that consistently refashions itself, and it will carry the resonances of not only the staple examples that Kim, Wong, Berssenbrugge, and Kapil have set through their writing and community contributions, but also the Asian American women poets who are attempting to archive the history from which they write and also to practice it so that this poetics is indeed a “continuum”—drawing together past, present, and future, without fear and with absolute daring. → Episode #115: Review of BLACKBIRD FLY by Erin Entrada Kelly!